Our nominees for the “Hardest-working Heroes” of SHOT Show 2016 are our friends Ed and Steve, aka the 6.5 Guys. Over the course of four days, this tireless duo completed over FIFTY short videos. They visited dozens of manufacturers, finding the “latest and greatest” rifles, stocks, actions, scopes and other hardware. While in Vegas, the 6.5 Guys managed to visit most of the top-flight optics-makers. Here are videos reviewing products from Nightforce, Vortex, and March. To see 50+ more videos, visit the 6.5 Guys YouTube Channel. The new 4-14x50mm SHV scope from Nightforce is available with either 0.1 Mil or 1/4-MOA clicks, with two reticle choices: MIL-R and MOAR. The new 6-24x50mm Razor HD AMG is a made-in-USA scope with a full 25 MOA of elevation in one turret rotaion. Vortex says this scope rivals anything on the market in its category. 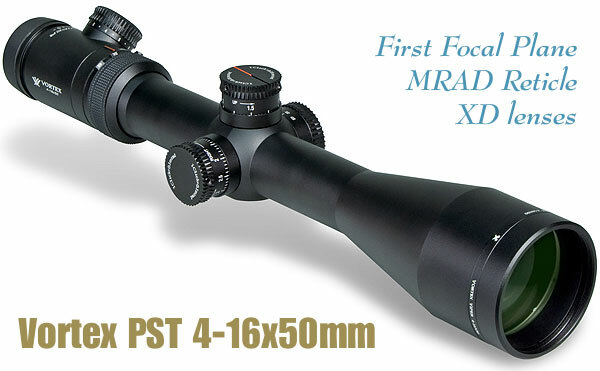 March’s popular 3-24x52mm scope is offered with either 0.1 Mil or 1/4 MOA clicks. The particular model featured in the video has 0.1 Mil clicks and an illuminated reticle. March Optics USA also offers a remarkable 5-50x56mm scope that can work for everything from short-range practical matches to extreme-long-range shooting. One of our staffers has the 5-50X March and he uses it for both Tac Comps and 1000-yard F-Class matches. Share the post "SHOT Show Optics Reports from the 6.5 Guys"
Nightforce Optics has created quite a stir in the tactical shooting community with the announcement of its new 5-25x56mm First Focal Plane scope, which it calls the “B.E.A.S.T.”. The news is in the numbers — this new scope offers a whopping 120 MOA of elevation travel, and you get a full 60 MOA travel with each rotation of the turret. That’s right — 60 MOA with one turn. With many modern cartridges you can get to 1200 yards (and maybe farther*) with a single revolution — that eliminates all sorts of user-error issues when dialing back-and-forth between yardages. This is a first-focal-plane design, so the reticle stays constant relative to the target, allowing ranging at any magnification. The scope is offered with four (4) click-value choices: 1/4 MOA, 1/2 MOA, 0.1 Mil, and 0.2 Mil. Whether you chose MOA clicks or Mil-based clicks, you can get an appropriate reticle because Nightforce offers both the MOAR ranging reticle and the Mil-R ranging reticle. The three other reticle options are: MD2.0, TReMoR, and H59. The new B.E.A.S.T. 5-25x56mm Nightforce has a mounting length of 5.92″ and weighs just 39 ounces. If you need illumination for low-light work, you’ll like the new B.E.A.S.T. scope. It offers external-control digital illumination with Unique i4F™ four-function brightness control. Other features are listed below. DOWNLOAD Nightforce PDF Spec Sheet for 5-25x56mm B.E.A.S.T. Scope. Nightforce says that “B.E.A.S.T.” stands for “Best Example of Advance Scope Technology” — some marketing guy’s bright idea we suppose. Perhaps “B.E.A.S.T.” better signifies “BEAST of a price”. This scope, with either MIL-R or MOAR reticles, costs an astounding $3,298.00! You can build a pretty darn good custom rifle, all premium components, for less than that! *We used JBM Ballistics to plot the trajectory of a .308-caliber 168gr Berger Match Target BT launched with a 2800 fps muzzle velocity (sea level with 59° temp). Starting with a 100-yard zero, JBM calculates 52.5 MOA drop at 1200 yards and 62.6 MOA drop at 1300 yards. Share the post "New Nightforce 5-25x56mm FFP Scope with 120 MOA Elevation"
While we were somewhat disappointed that we didn’t see many all-new precision rifles at Media Day 2012, there were plenty of new riflescopes on display. Among the most impressive new optics were rugged new high-zoom-range, First Focal Plane (FFP) tactical scopes from Hensoldt (Carl Zeiss), Leupold and Trijicon. These new scopes all featured fat tubes, compact overall length, and abundant elevation travel. These lastest top-end FFP tactical scopes offer as much as 26-power in a form factor not much bigger than a “normal” 4-16X scope. Hensoldt showcased a very impressive, prototype 3.5-26x56mm FFP tactical scope. Though this scope offers a whopping 7.4X zoom range and 26-power on top, this new Hensold is relatively compact. The reticle in these prototype versions was a very useful (and simple) milradian-based reticle that we hope Hensoldt retains in the production versions. The Hensoldt boasted an impressive 36 Mils of total elevation travel in two (2) turns of the turret. The new Hensoldt still shares the same superior glass and compact size that puts these scopes at the top of their class. We tested a prototype mounted to an Accuracy International AX 338. Expect the production version to be the same size and cost approximately $4000.00. As you can see in the video, the new Hensoldt coupled with the new Accuracy Int’l AX in 338 Lapua Magnum worked very effectively at 900 meters in some tricky winds. This combination made it fairly easy to break clay pigeons on the bank at 900 meters. Off camera this combination continued to show great accuracy and very effective design features. Leupold showed off a brand new MK-8 3.5-25x56mm with a Horus reticle and a beefy main tube. Again, this featured a lot of elevation in one turn as well as a pinch-and-turn locking turrets. This is a big leap forward for Leupold and we feel this will be well-received in the tactical world. Along with the new MK8, we also sampled Leupold’s new MK6 3-18x50mm. This shared similar features as the 3.5-25, and was incredibly compact as well. We expect the MK8 to sell near $4000 and the MK6 to be substantially less, likely under $3000 according to company reps. It was apparent at Media Day 2012 that scope companies have worked hard to provide more features and more performance in their high-end tactical scopes. Consequently, the latest generation of scopes offer some very interesting and useful innovations — wider zoom range, more compact size, more elevation travel per rotation, and “goof-proof” turret mechanisms. We can only hope that, with more competition in this market, prices may become more reasonable. $4000 is an awful lot of money to pay for a scope. Share the post "Media Day Report: New High-End FFP Tactical Optics"
Experienced tactical shooters will tell you that a first focal plane (FFP), mil-mil scope is the smart way to go — if you need to range targets at unknown distances. This gives you mil dots for measuring the size of a target, a reticle that can range at all power settings, plus 1/10th mil-radian turret clicks for compatibility. There are a lot of “tactical” scopes marketed these days, many of which are just medium-power target scopes with bulky turrets. The top-end tactical scopes do offer the right combination of features, but you can easily spend $2000.00 or even $3000.00 on a good FFP mil-mil optic. With its Elite 4200 series of tactical scopes, Bushnell has created a truly affordable series of quality 30mm-tube, mil-mil optics. The FFP Elite 4200s rival some tactical scopes costing twice as much (honest). And right now you can save even more. Through the end of February 2011, MidwayUSA is offering huge discounts on the Bushnell 4200 FFP 3-12x44mm and 6-24x50mm tactical scopes. Both these scopes feature FFP mildot reticles, 30mm tubes, 1/10th mil adjustments, and illumination. And the prices are amazing. The 3-12X is marked down from $849.99 to $594.99, a $255.00 savings. The 6-24X price has been slashed from $999.99 to $699.99, a $300.00 savings. Midway’s prices are good through 2/28/2011. If you need a good tactical scope for under $700.00 these Elites will do the job. And for those who want a solid hunting scope with good glass, MidwayUSA is also discounting the Bushnell Elite 4200 2.5-10X50mm scope with illuminated T-Dot Reticle. The rugged 2.5-10X features 1/4-MOA clicks, and is now just $405.99 on sale, marked down from $579.99. Note: As Bushnell’s Elite 4200 series scopes have somewhat limited elevation range compared to the high-dollar tactical scopes, we recommend mounting these optics on a +10 or +20 MOA rail. As an added incentive, Bushnell is offering a FREE two-piece olive drab rainsuit to all purchasers of Elite riflescopes. To get your rain suit, just send in the product UPC code, a copy of the sales receipt, and $15.00 to cover shipping and handling. This offer is good through 12/31/2011. Story Sourced by Edlongrange. Disclosure: MidwayUSA advertises with this website. Share the post "Bushnell Elite 4200 Tactical Scopes on Sale at MidwayUSA"